The founder of Armadillo World Headquarters recalls the lively history of this legendary music venue and its role in launching cosmic cowboy/redneck rock and making Austin, Texas, the live music capital of the world. On August 7, 1970, Eddie Wilson and a band of hippies threw open the doors of Armadillo World Headquarters, and the live music capital of the world was born in Austin, Texas. Over its ten-year lifespan, the Armadillo hosted thousands of high-profile musicians—Willie Nelson, Frank Zappa, Bruce Springsteen, Taj Mahal, AC/DC, Charlie Daniels, the Ramones, Roy Buchanan, and Bette Midler, to name a random few. The Armadillo helped define the Austin lifestyle, culture, and identity, setting the stage for successors such as the SXSW music festival, PBS’s Austin City Limits , and the ACL festival, which have made Austin an international destination for music fans. 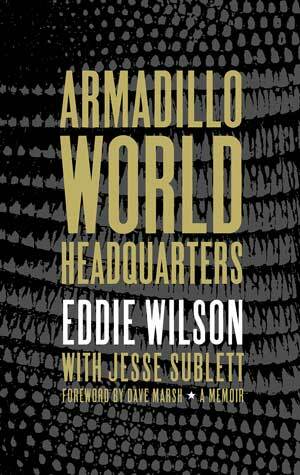 In this rollicking memoir, Eddie Wilson tells the behind-the-scenes story of the Armadillo from the moment he first peered into a derelict National Guard armory building and knew that destiny had found him. He vividly describes how two previously clashing groups—rednecks and hippies—came together at the Armadillo, enjoying a new blend of country music and rock that spawned a many-named movement: cosmic cowboy, progressive country, and redneck rock, among others. Wilson also reveals the struggles and creative solutions that kept the doors open, the angels who provided timely infusions of cash, the janitors and carpenters who maintained the Dillo, and the artists who created iconic poster art. Extensively illustrated with candid photographs and music posters, Armadillo World Headquarters recounts the story of this legendary venue as no other book can. Wilson founded and ran the Armadillo until 1976, when he left to open a restaurant called the Raw Deal and then, in 1981, took ownership of Threadgill’s, where he continues to purvey live music and Southern cuisine. Sublett is a writer, musician, and artist known for his long-running rock trio, the Skunks, and his mystery novels. Well-known rock critic Marsh has written more than twenty books about rock and popular music. A founding editor of Creem, he has written and edited Rock and Rap Confidential for twenty-five years.